Mounts on a wall plate. Mounts on a wall track or above a cabinet. 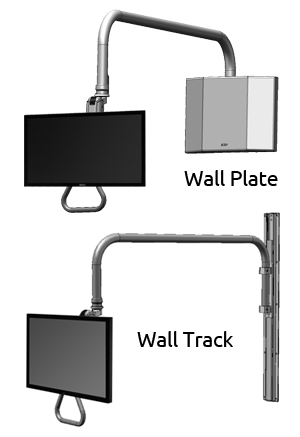 ICW’s unique Overhead mounting arm is an excellent solution for healthcare, dental and industrial applications that require extensive range of motion for a monitor. 77″ (196 cm) of reach. 180° of horizontal rotation at wall mount. 24″ (61 cm) of vertical adjustability. Monitor swivels 360° for precise viewing angles. Supports up to 28 lbs (12.7 kg). The Overhead Arm mounts on either a wall track or wall plate, reaches 77″ (196 cm) and has a stowed depth of 8″ (20 cm). The mounting arm rotates 180° horizontally at the wall and has vertical reach of 24” (61 cm) so you can position the monitor exactly where you need it. The Overhead mounting arm is configured with the Ultra 182 arm which enables the monitor to be adjusted 24″ (61 cm) vertically and 360° horizontally. The monitor easily tilts 90°, swivels and rotates to any viewing angle using the convenient monitor handle. The Overhead arm is effortless to move in any direction. Internal cable management creates a neater appearance, protects wires and simplifies cleaning. Adjustable rotation stops protect the equipment and facility from damage. Machined from strong billet aluminum, the unit is powder coated for a durable, lasting finish. ICW monitor mounts are designed, engineered, manufactured and hand-assembled with complete attention to detail. The Overhead mounting arm will provide years of dependable service. The Overhead monitor mounting arm supports up to 28 lbs (12.7 kg). The arm provides extensive range of motion so the monitor can be positioned exactly where needed for best viewing angles. The Overhead arm enables a monitor to be suspended on either a wall track or wall plate, pulled out when required, and stowed up and out of the way when not in use. Internal cable management for regular or low voltage protects wires from damage and simplifies cleaning. The Overhead arm is machined out of billet aluminum for strength and durability. Available in 11 popular powder coated finishes to match your décor. The monitor easily tilts 90°, swivels and rotates to any viewing angle. The Overhead mounting arm is configured with the Ultra 182 arm which enables the monitor to be adjusted 24″ (61 cm) vertically and 360° horizontally. A convenient monitor handle protects the monitor from fingerprints and damage.